Exciting news! 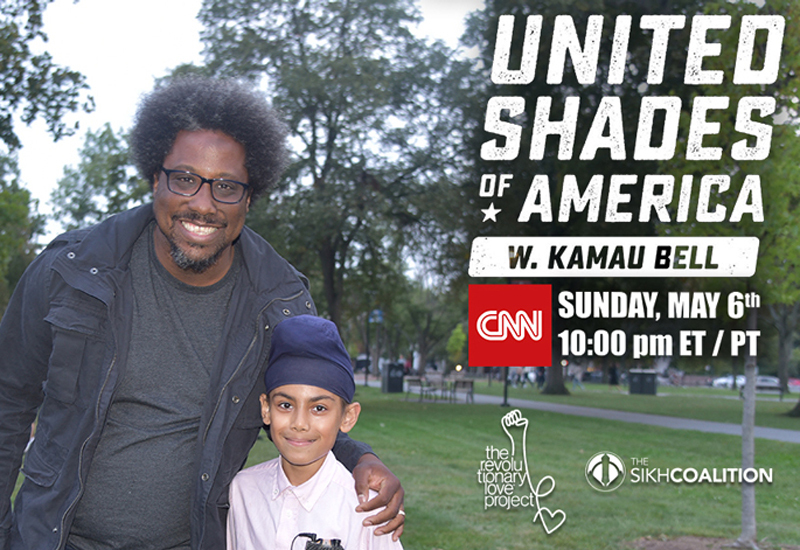 This Sunday night, CNN’s Emmy Award-winning show United Shades of America will feature Sikhs in America! This will be the first-ever hour-long cable episode entirely devoted to the Sikh American community. We are proud to have helped make this happen. The episode is dazzling — emotional, educational, witty, and wise. It’s also groundbreaking. It’s the first time America will see Sikhs tell our own stories, in our own voices, for an hour on television. We answer all your questions: What is the story of our faith? Why do we wear turbans? What calls us to face hate with the ethic of love? And with W. Kamau Bell as host, it’s a full hour of entertainment. — or watch it online after it airs. It’s hard to describe what this moment means to me and so many Sikhs. I think back to the aftermath of 9/11 when the epidemic of hate crimes barely made the evening news. It was before social media, and we urgently searched for ways to gain national attention. I spent five years making a documentary about Sikh Americans with my husband. We celebrated when we got a minute of coverage on CNN. That was the most we could hope for. Fast forward — today hate crimes against our communities are the highest they’ve been since 9/11. But we finally have platforms to speak to national audiences. And not just as victims. This entire hour on CNN will showcase what our fellow Americans can learn from the Sikh tradition: it inspires a path of love. and my favorite, Harpreet’s son Dilzafer Singh (watch his clip here). Scroll down to spread the word about the show and host a watch party. In this time in our nation, every work of art on television and film is political — it either reaffirms the stereotypes that are killing us, or counters them. 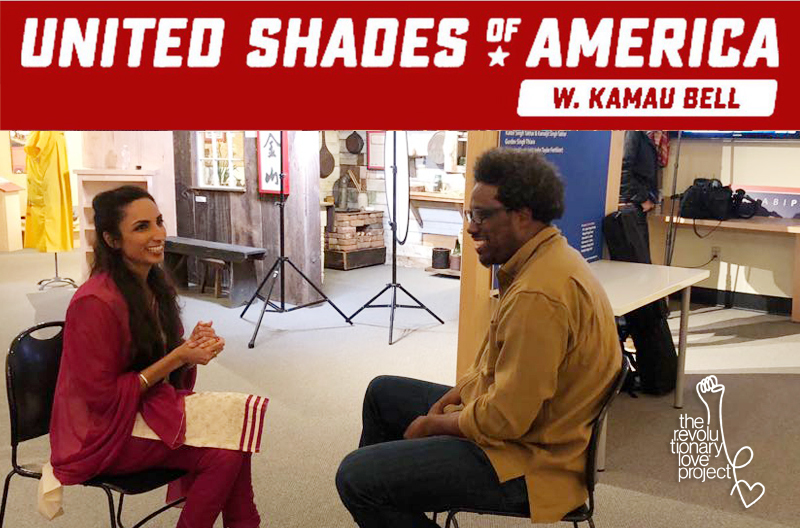 United Shades of America tells stories every week that break down stereotypes and break open hearts and minds. And Kamau’s warmth and humility models for a national audience every week the kind of wonder that is the starting point for Revolutionary Love. Thank you to the entire team at United Shades for your care and vision, especially Donny Jackson (Executive Producer) and producer Falguni Lakhani. It was an honor to work with you. Thank you to the Sikh Coalition — we connected them to the team and they worked hard to help make this episode a success. And thank you Kamau for your work in the world, including lending your voice to the movement to #reclaimlove as a force for justice. The Revolutionary Love Project’s contribution to this episode is part of our ongoing work to help bring the ethic of love into American public life, including entertainment. We currently have our own TV show in the works at NBC — the first series to feature a Sikh lead on television. The show didn’t get slotted into this season, but we are pleased to announce that we are developing the show at NBC for next season. Thank you to everyone who has been following for your enthusiasm, and congratulations to Nitasha Sawhney and Neha Singh Gohil — we selected “Jind Kaur,” the name you suggested, for our Sikh lead’s mother. Will keep you all posted as the journey unfolds. In the mean time, let’s celebrate United Shades of America this weekend! SPREAD THE WORD — STARTING NOW! Join the Sikh Americans featured in the episode including Valarie Kaur for a Twitter town hall about the episode on Wednesday, May 2nd 3-4pm ET, hosted by the Religion Newswriters Association. Follow @valariekaur @sikh_coalition @hsingh @americanturban. Use the hashtag #SikhsOnTV. Invite your family, friends, colleagues, students, and classmates to a watch party! Watch the episode together live on Sunday or later via streaming from the United Shades website. Live tweet and/or post pictures from your watch party with #SikhsOnTV and #UnitedShades. Kamau and Valarie will be tweeting too and looking out for you!